Traditions have changed a lot for the Bedouin in the past 40 years. Marriages used to be arranged between families, and the wedding would be held in a traditional goat/camel hair tent in the desert, where a Sheikh would bless the couple and a dowry agreed upon. These days young Bedouin men and women have more contact with each other through mobile phones etc, and are now marrying for love (previously believed to be a very fickle thing to base a marriage on!). Couples can meet when in the company of other friends or family to get to know each other (never alone). The engagement period lasts around 12 months, after the suitor has asked the girls father for her hand. A wedding is not just a one day affair. There is a women’s party and a men’s party prior to a bigger gathering of both sexes in the desert. Firstly, close friends and family gather at the girls house during the day and a big feast of meat and rice is prepared on large trays, which everyone eats from with their hands. Close family members of the men eat lunch in a separate part of the house. After lunch the parents of the bride and groom will join the local Sheikh to finish their dowry discussions. A ring is placed on the brides right hand, and if the groom has money, he will buy the bride some gold jewellery. The groom also needs to be able to provide the bride with a new home (bought or rented) and be able to support her. In the evening there is a party in the neighbourhood close to the brides house. Fabric tent walls are erected to close off an area for the party, and after the sunset prayer, all the women gather in this place for the evening party. The bride spends the morning at a beauty salon getting made up – it is fashionable to wear lots of white foundation to make her look pale! In the evening her brothers and sisters drive her through the streets, tooting and waving scarves out the window of the cars – this is called the zefa. She then arrives at the place where the party is already in full swing. Loud Egyptian music blares out through loud-speakers, old ladies sit around in clumps smoking khodri (a local tabacco), small children run excitedly around or help serve soft drinks/ tea /coffee to the guests, and adolescent girls show off their hip-shaking dance moves in their beautiful new clothes. 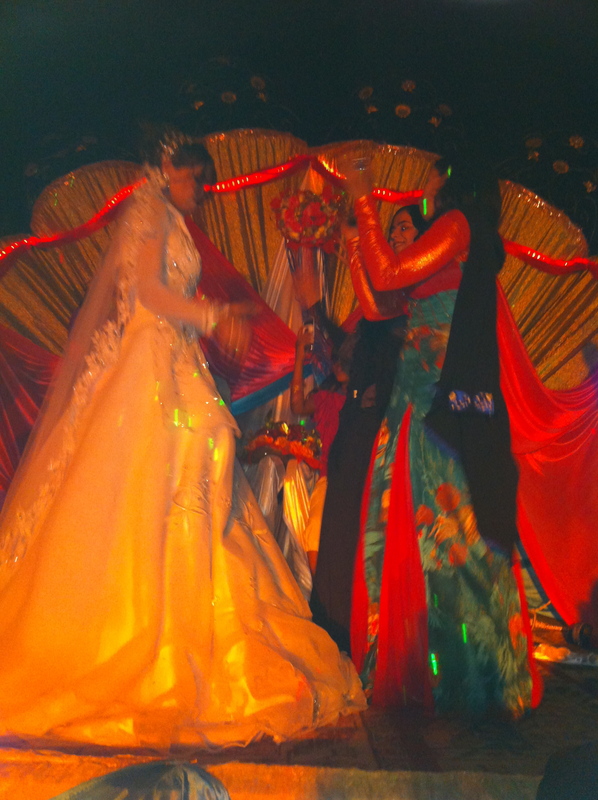 The bride and groom sit on a stage over-looking the party while the hectic festivities take place around them. Eventually they will also get up and dance together and with others, and can leave whenever they like. The next party is in the desert a few days later, it is held in a wedding wadi, Wadi Megharah, as it is wide and open, and enough space for huge crowds. Anyone and everyone is welcome, and a lot of people sleep the night there. Even though both men and women are there, they still have separate areas to talk and dance. Sometimes women will dance for the male guests, but they always cover their face completely so that nobody knows who they are. Me in my best gallibeya! A couple of days later there was the party in the desert. 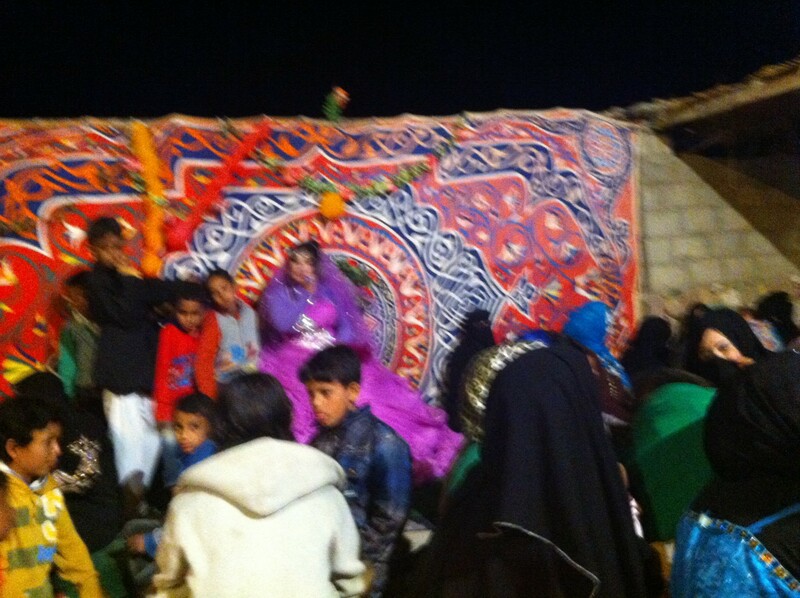 I was especially keen to go to this party because I had only been to one other desert wedding before and I was desperate to see the traditional Bedouin wedding dance, which is sometimes spontaneously performed. I had missed it the last time, as it is always “inshallah” (if God is willing) as to whether or not it will happen. As old traditions are slowly dying out around here, I felt it would be a privilege to see this dance. 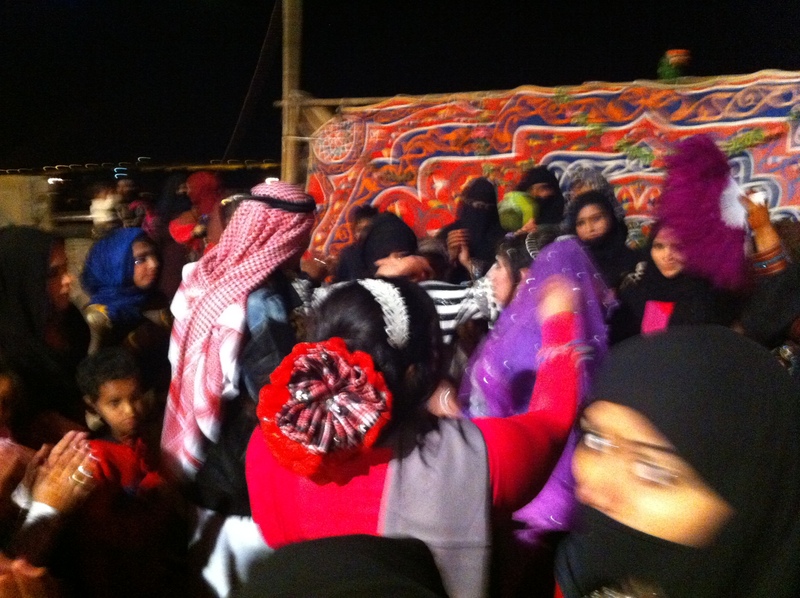 Also, 10 couples had just married in Dahab and this party was for all of them, so there were lots of Mzeina (the local tribe) Bedouin from all over South Sinai. I felt for sure this guaranteed it to be a joyous reunion of the familes/clan/tribe, and thus there would be a big party this time. However I was to find out you can’t assume anything! So I arrived in the desert with my friend and local taxi driver, Mahmoud, around 5pm, just before sunset. Dotted around the wadi were arishas (palm frond shelters) full of families chatting around their fires, drinking tea and catching up on news, and their Toyota pickups (the new Bedouin “camel”). Cars were coming and going constantly up and down the wadi. There was a huge private arisha for the women to gather and talk, and a large open-fronted tent for the men, complete with coloured flashing lights. The zefa arrived with horns beeping. A meal of goat meat and rice was served in the big communal areas, but also each family made its own meal, as there were so many people there noone was expecting to get a lot to eat in the communal areas. My friend and I were lucky enough to pass through my Dahab neighbours arisha and get invited to eat with them. It was a lovely warm, starry evening, which for the most part I spent wandering around and getting random invites for tea with various women, which was lots of fun. Whenever i asked anyone if they thought there would be a dance, the answers was always “msharifa, inshallah” (I don’t know, if God is willing). 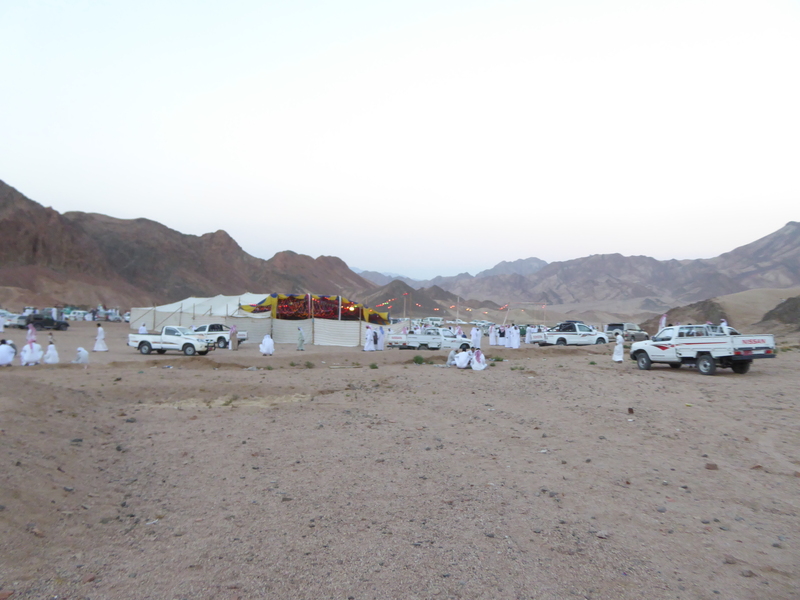 Bedouin weddings are not planned, they just happen! At around 9pm there was a rumour that someone was going to play the Oud, or even the Simsimeya (stringed instrument) – but nothing happened. Around 11pm a lot of cars left the wadi to return home, so I retired to my rug (my bed for the night) for a beautiful night under the stars. Tea at dawn by the fire. The next morning I was woken early by the old father of the family I was camped with. He had arisen to do his dawn prayer. The sunrise backlit the mountains with an orange glow and the silence of the desert was bliss. Gradually the hum of waking families filled the air, as everyone in the wadi got up to light the fire. After a few cups of tea with random visitors it was time to go home. The old father told me there had been no music and dancing last night as there had been a death in Nuweiba and also one in Dahab, and it would have been disrespectful to the dead to celebrate. But somehow it didn’t really matter in the end. It had been a beautiful experience anyway, made even more special by the fact that my friend and I were the only foreigners there. PS: This is a great video of a wedding of another tribe in the South Sinai.